So I’m afraid that I haven’t got anything exciting to show or tell today…I’ve been *puts on dramatic voice* struck down with tonsillitis. /drama. Not only is Meryl Streep amazing as always, but obviously the subject was something I was going to love from the get-go. 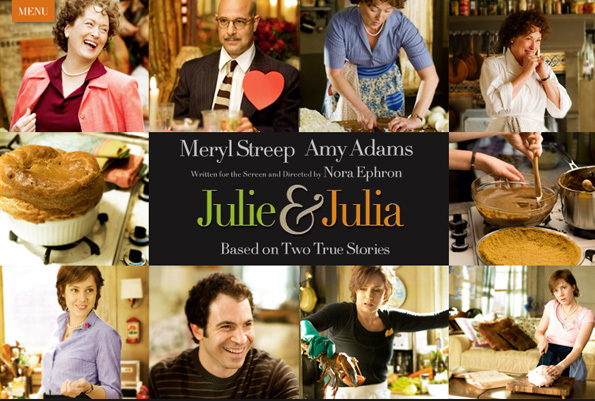 For anyone who hasn’t seen the film, it is a story split in two – modern day vs. the day when Julia Childs (famous cook) was in her career prime. In the modern day, a frustrated young Julie finds nothing else helps her feel better about other problems in life than to cook away those worries. She begins a journey of creating every dish in Julia Child’s cookbook over the period of a year, blogging about her dishes as she goes. On the flip side of the story, it shows Julia’s journey into becoming an enthusiastic cook to a loved cookery show presenter, inspiring people for years to come.